Mr. Benjamin Folfrod, who is on the summer vacation, gives an explanation of major secret societies in the world. The report is quite interesting because it provides a lot of important information. With regard to an article in the past, I pointed out in my comment that Kim Jong-un is the leader of a very important group. At that time, I hid the fact that the Dragon family is at the center of the group. However, Mr. Fulford picked up the Dragon family as the second major Asian group in the report which says that North Korea is one of their main strongholds of the group. The report supports my intuition. Kim Jong-un is the person set up as a sacred palanquin by those who try to newly create a neo Manchu dynasty (consisting of Manchu, the two Koreas and Japan). In a word, Kim Jong-un is descended from all important royal families. There is no doubt that behind-the-scenes Emperor and Yatagarasuwho advocated Kim Jong-un as the emperor of a neo Manchu Dynasty. According to the Fulford report, the Shinto-connected Three Legged Crow, that is, Yatagarasuis not a major player in the current battle for the planet Earth. This is true in a way, because Yatagarasunever gets involved in political matters. However, Yatagarasuis the strongest psychic group on Earth and Yatagarasuoutshines any other secret societies in terms of psychic powers. From the viewpoint of management of Earth, therefore, it turns out thatYatagarasuis the most important secret society. I explained in the past that the heavenly world is governed by the organization of deities shown in Futomani-figure. What we are doing is to build a bridge between the organization in the heavenly world and the organization on Earth. The last diagram shows the structure of the organization. In my view, major secret societies and political societies in the world will converge on the Five Dragon Societies which receive instructions ofYatagarasu. Probably, the Black Dragon Society in the future will be the group led by the Goldman Families Group (Committee of 200) Mr. Eiken Itagaki calls. Before the autumn battles begin, it’s a good time to look at some of the world’s most important secret societiesand the governments, religions, and agendas they are associated with. The first thing people must understand when looking at this issue is that in the real world, spy agencies, secret societies, and armies are subservient to religions. Let’s start with the Asian secret societies.<snip> The biggest is probably the Hongmen, with 55 million members, mostly located in China and in Asian communities around the world.Chinese President Xi Jingping is a member of this group. 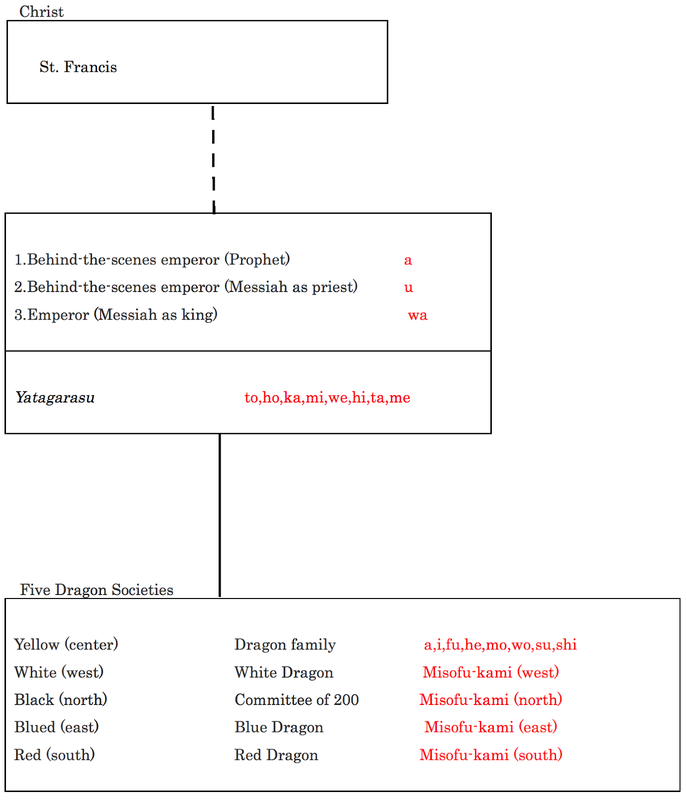 The second major Asian group is the Dragon family.This is a grouping of old royal bloodlines with their networks of retainers and their stashes of historical gold. They are strongest in Taiwan, Northern China, and Southeast Asia. North Korea is one of their main strongholds, since the country is the real heir to the Manchu Dynasty which ruled China during the Qing Dynasty(1644-1912). Another grouping that used to be very powerful was the Black Dragon Society (BDS). They were behind the World War 2 Imperial Japanese push for a greater East-Asian Co-prosperity sphere. There are other Asian groups and subdivisions such as the Shinto-connected Three Legged Crow, but they are not major playersin the current battle for the planet Earth and will align with whomever emerges victorious. Hearing a rumor, I’ve come to the Togu Palace, residence of Crown Prince Naruhito. As rumored, *Harimaya right-wing trucks go around the palace many times. The trucks never move around at random, but they go only around the Togu Palace. They might mean it in their own way. Harimaya is a manufacturer/seller of rice crackers. The company has some right-wing sound trucks, which go around Tokyo. The president worships Emperor as a god.